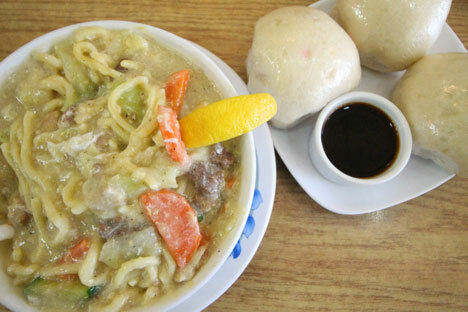 Chef Cecilia Icasas Fernandez of Cid’s Ma Mon Luk Restaurant in Niles, Illinois shows you how to prepare this classic noodle dish. In a pan, sautee chopped garlic and all the ingredients. Then, add chicken-soup broth and put in the thick noodles with a pinch of salt, MSG, black pepper, and corn starch. Add miki noodles into hot broth, cooking for 3 minutes. Add raw egg while constantly mixing them. Dissolve corn starch in the water and slowly add to thicken the broth, depending on your preference. Transfer to a serving bowl. Enjoy!